Call the search off I have found the best non-medicated lip balms ever. No really I mean that. I have been all but forcing my new found love for Epic Blend lip balms on all who will listen. Natural, organic lip balms that are packed full of wonderful ingredients such as organic beeswax, organic coconut oil, and organic sunflower oil as well as being free from petroleum and synthetic preservatives. 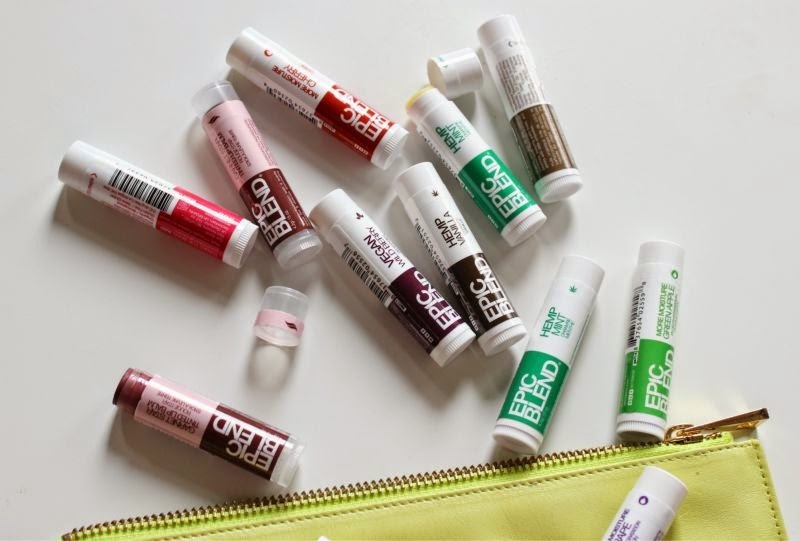 I like that the Epic Blends lip balms come in typical chapstick tubes for ease of use - I loathe putting on balm with my fingers, it is just messy. They are compact - I have one in every coat pocket and rolling around in every handbag. They smell ah-maz-ing, the fragrance range is out of this world (although I personally would love a lemon balm with SPF) with limited edition scents (all of which are scented using natural oils) and tinted balms joining the line up. My personal favourites are Pineapple Mint, Cherry and Grape but there is not one balm within the vast range that I don't like which is a first. On the lips they feel incredible, so, so moisturising yet light. We've all had lip balms that drag on the lips haven't we? Well not Epic Blends I kid you not when I say that they have the creamiest texture ever - they simply glide on the lips and stay put. One application easily wears on my lips for a good solid hour and truly banish any signs of dryness. I realise that I am gushing but I really can not get enough. I was sent press samples but I am going to order the Banana and Chocolate Rum variants later on today to add to my stash. This brand truly deserves more fans and credit, I urge you to check them out! You can find Epic Blends Lip Balms here - link. I totally agree with you, I always like to not use my fingers. These sound really cool and I will defintily be trying them out! This is currently my go-to lip balm. So hard to find a good organic lip balm with all natural ingredients. Perfect to throw in your purse. I have the Dior Creme de Rose which is my holy grail but I don't bring that out as I don't want to stick my fingers in the pot when I'm out. You can't beat a good lip balm, these sound great! Those lip balms sound awesome and I love the packaging :) !! I think I might have to try these! These sound amazing! The range of scents is definitely what drew me in, I'm down for any kind of mint!